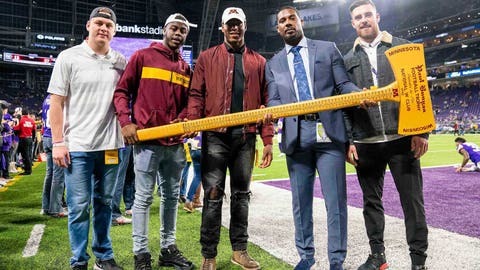 Sunday, Nov. 25: Members of the Minnesota Gophers football team spend time on the field with Paul Bunyan's Axe before the Minnesota Vikings host the Green Bay Packers. 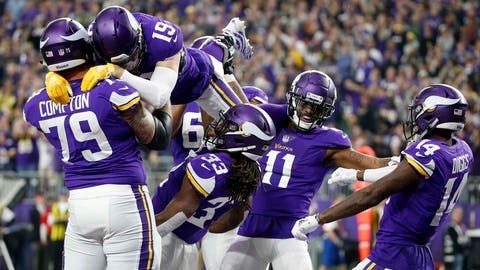 Sunday, Nov. 25: The Minnesota Vikings celebrate Dalvin Cook's first-half touchdown in a 24-17 win over Green Bay. 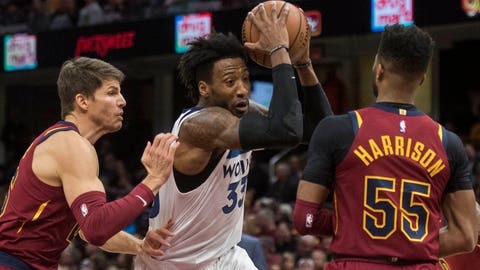 Monday, Nov. 26: Robert Covington poured in 24 points -- his highest total in a Minnesota Timberwolves uniform -- to help take down Cleveland. 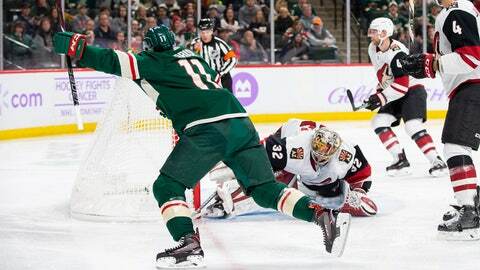 Tuesday, Nov. 27: Wild forward Zach Parise scores in the second period against Phoenix Coyotes goalie Antti Raanta. 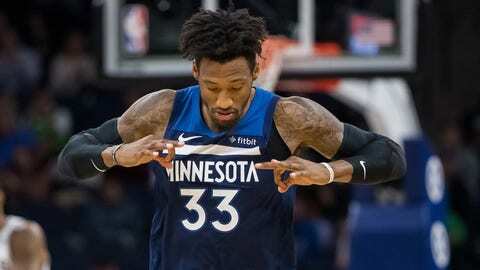 Wednesday, Nov. 28: Robert Covington celebrates a 3-point make in the Minnesota Timberwolves’ 128-89 win over San Antonio. 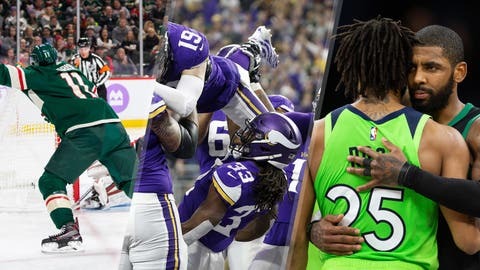 Thursday, Nov. 29: Wild's Marcus Foligno reacts after Mikael Granlund scored against the Columbus Blue Jackets. 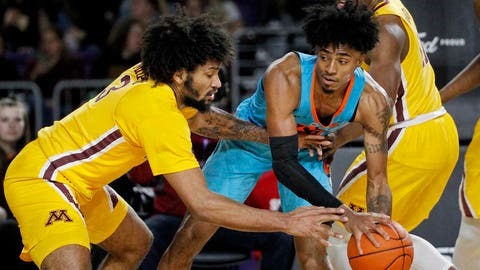 Friday, Nov. 30: Jordan Murphy defends Oklahoma State’s Michael Weathers in the Minnesota Gophers’ 83-76 win over the Cowboys at U.S. Bank Stadium. 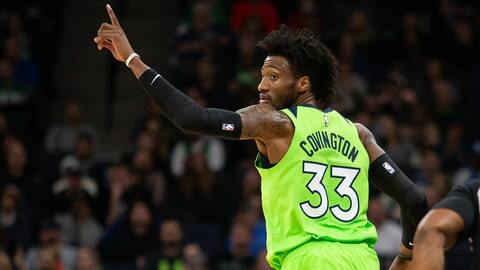 Saturday, Dec. 1: Minnesota forward Robert Covington reacts after scoring against the Boston Celtics. 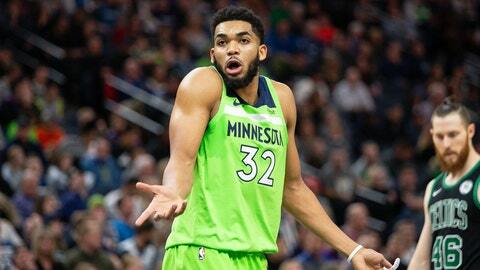 Saturday, Dec. 1: Timberwolves center Karl-Anthony Towns shrugs after drawing a foul against the Celtics. 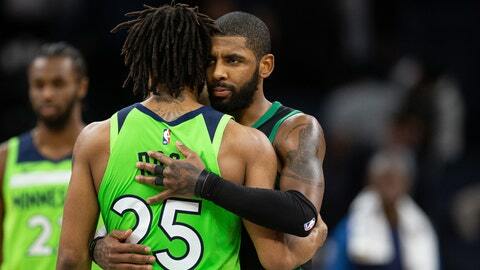 Saturday, Dec. 1: Celtics guard Kyrie Irving and Timberwolves guard Derrick Rose embrace after the game.